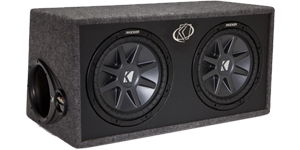 Home > Kicker > Enclosures > Dual 10"
Our Kicker car audio Dual 10" subwoofer box packages are like instant bass in your trunk! These sub boxes are specifically designed by Kicker engineers which allow for the maximum bass output! The enclosures are available with a final impedance of either 2 or 4 Ohm to match your amplifier. We have packages available with Kicker COMP, CVR, L5 or L7 series sub woofers to match any listening style.